Plants have many ways to disperse their seeds to a suitable spot where they can germinate. Kōwhai trees have bright yellow seeds that have the amazing ability to float on water, including across oceans. 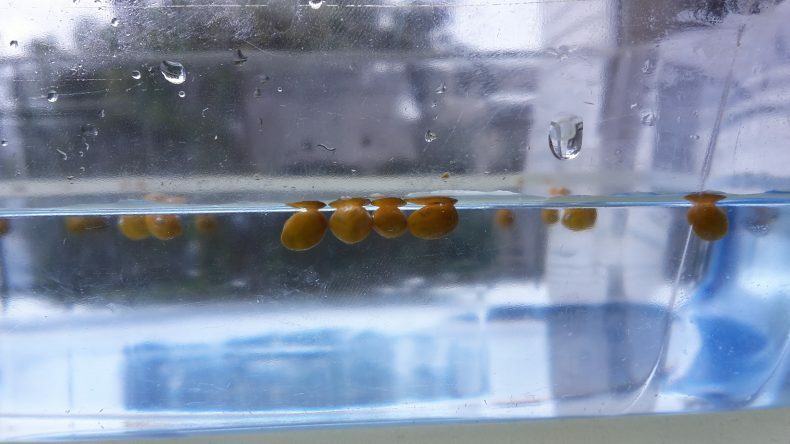 Experiments have shown that kōwhai seeds can remain afloat in seawater for years and still germinate. Recent research led by scientist Lara Shepherd used DNA sequencing to examine the origins of kōwhai seeds found on the beaches of the Chatham and Kermadec Islands. Kōwhai doesn’t grow on the Kermadec Islands, so any seeds found there had to have floated from elsewhere. Wood from tree species that only grow on the New Zealand mainland has previously been found on beaches of the Kermadec Islands. However, seeds of tropical plant species that only grow on Pacific Islands have also been found on the same beaches, suggesting oceanic dispersal is possible to the Kermadec Islands from different directions. We sequenced four kōwhai seeds collected from a beach on the Kermadec Islands. We then compared the results to the sequences we had previously obtained from kōwhai in New Zealand and its relatives around the world. Interestingly one of the DNA variants we found in these seeds was not detected among our sampling of kōwhai from either New Zealand or overseas. This suggests that there is new genetic variation still to be found. The other three seeds all had DNA variants only found in New Zealand and which were most common in the north-east of the North Island. This suggests a North Island origin for these Kermadec Island seeds. 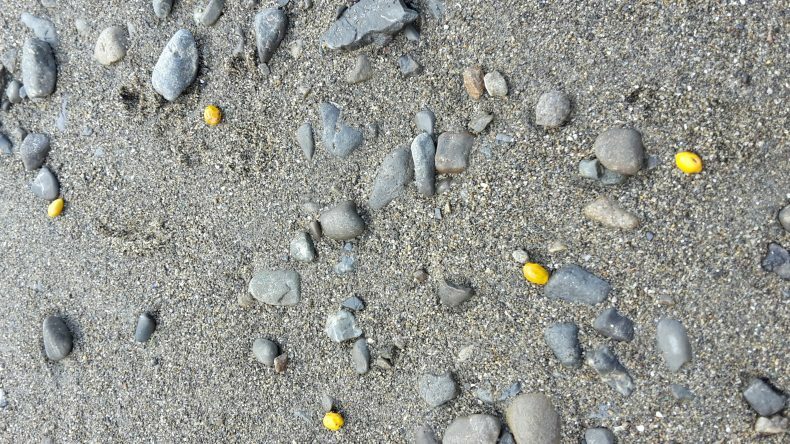 Kōwhai seeds are reportedly common on Chatham Islands beaches – one scientist collected 256 kōwhai seeds in a single day along only 400m of beach! One species of kōwhai does grow on the Chatham Islands but the largest population occurs on the margins of a lagoon that is often closed off to the sea, meaning it’s unlikely to be the source of seeds found on the coastal beaches. Whether these beached seeds originated from kōwhai trees on mainland New Zealand 850km to the west or from the resident population of kōwhai from the Chatham Islands is unknown, and scientists have speculated about the origins of such seeds for over 150 years. Our DNA sequence results from 13 Chatham Island beach seeds suggested that while it is possible that some of the seeds originated from the kōwhai trees growing on the Chatham Islands, others (or possibly all of them) likely drifted across from New Zealand. To further complicate matters some of the DNA variants found in the Chatham Island beach seeds have also been found in Chile, Gough Island (Atlantic Ocean), and the Juan Fernandez Islands (Pacific Ocean) meaning that we can’t exclude these distant places as the origin of some of the seeds! Nevertheless, research into ocean currents suggests that the predominant currents arriving at the Chatham Islands originate from the east coasts of the North and South Islands suggesting these regions are the most likely sources of the seeds. Blog: Kōwhai’s global family tree – The distribution of kōwhai and its close relatives throughout the Southern Hemisphere has intrigued scientists, including Charles Darwin, for over 150 years. Recent research led by Lara Shepherd has revealed more about the relationships among this iconic group of plants. Blog: What can kōwhai tell us about the location of New Zealand’s forests during the ice ages? – Science researcher Lara Shepherd explores kōwhai trees, one of New Zealand’s most widely recognised native plants and our unofficial national flower. Blog: Coastal kōwhai in the south of its range – natural or planted? – Science researcher Lara Shepherd explores the distribution of kōwhai in New Zealand – largely found in the north and likely introduced in the south. Thanks for this interesting post. Why won’t kowhai grow on the Kermadec Islands? Is it just because the seeds land on the beach and its not a suitable place? I’m surprised such hardy seeds haven’t found a way to grow there. Thanks for your comment. I’m not sure why kōwhai isn’t on the Kermadec Islands as I would think that there would be suitable habitat there. If the seeds keep turning up maybe it will establish one day!